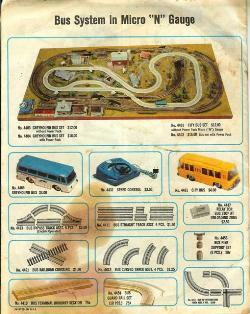 The Faller-made bus system, marketed in America under the “Postage Stamp” brand, had a number of track pieces and accessories. The lanes of the track were 3 cm (1 3/16”) wide. There were four different straight track pieces, along with a railroad grade crossing which used a straight segment of bus track. There also was a 90° crossing and a terminal section. There were three different track radii; “A” (9 cm outside radius) “B” (12 cm outside radius) and “C” (15 cm outside radius). Radius A, Radius B and Radius C were designed to be concentric, forming a three lane roadway when used together. There was a turnoff set which contained a pair of turnouts, where one bus could pull over to the side and be passed by the other bus. 4413 - Bus By-pass track assortment; 1 x Right-hand remote operated turnoff, 1 x Left-hand turn-back, 2 x 45° Radius B curve, 1 x 12 cm straight. The catalog which was the source of this information shows the City Bus, No. 4481, in all yellow livery. Other buses have been seen which were in blue & white livery and red & white livery. It is not known if these have different model numbers. The 4413 By-pass set contained a remotely operated turnoff piece which had a single solenoid. When this solenoid was momentarily operated, the turnoff was set to divert the approaching bus to the right side. When the bus passed over the turnoff, it was automatically aligned back to the “straight” position. The trailing turn-back had no moving parts since the buses were both moving in the same direction. The 4447 relay would allow for a bus to approach a bus stop and come to a halt. After a period of time, the bus would start up again and continue operation.